The “Stoner&apos;s Delight” at the Gallows. Recreational marijuana sales were scheduled to start in Massachusetts July 1. Now that’s been pushed back to August. Whenever it does actually happen, one thing is clear: Chefs have been preparing for this moment for years. If you’ve spent time eating around town, you know this. Maybe you’ve had Shojo’s “Shadowless” fries, cooked in duck fat, then topped in melted cheese and a mapo dofu-esque meat-and-bean curd sauce. Or Citrus & Salt’s grilled street corn, rolled in Flamin’ Hot Cheetos crumbs and smoked mayonnaise. You’ve been to Lincoln Tavern & Restaurant’s Friday Brunch Test Kitchen, where dishes like Fruity Pebble pancakes and taco Pop-Tarts are invented. You’ve eaten the Dogzilla — a bacon-wrapped hot dog stuffed with American cheese and jalapeno, topped with kabayaki sauce and bonito — at Hojoko, which is basically O Ya after a few bong hits. And at the Gallows, you’ve indulged in the Stoner’s Delight, a dessert of peanut butter mousse, bananas, chocolate ganache, and bruleed marshmallow Fluff. Wherever you go, stoner food is on the menu. 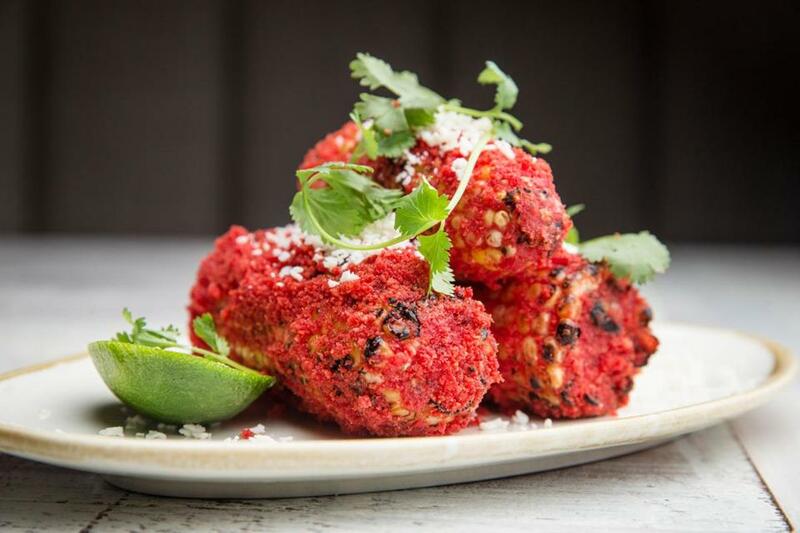 Mexican street corn at Citrus & Salt in Boston. We don’t much talk about marijuana when we talk about cuisine and its evolution, but the stoned appetite has long been an influence on what we consume in restaurants. Chefs make the food that they want to eat. And chefs — well, they have been known to partake of the devil’s lettuce. Plenty of studies have shown the links between cannabis consumption and appetite. In 2014, in the journal Nature Neuroscience, researchers published a study demonstrating that THC heightened the sense of smell in mice, and that in turn encouraged them to eat more. A 2015 paper from Yale researchers, in Nature, indicated that marijuana turns certain neurons from suppressors of hunger into promoters of it. (Plenty of late-night sessions in your friend Andy’s basement have shown the same, but this is science.) It makes sense that there might be overlap between a population that perpetually has the munchies and one that decides to concoct delicious food for a living. 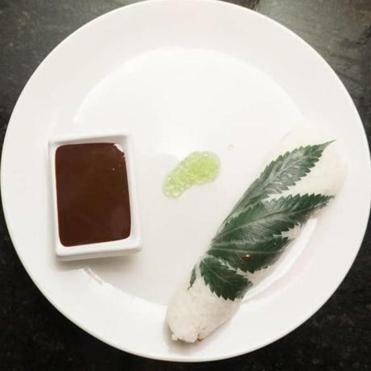 Strawberry-leather hand roll with apple noodles, sweet sticky rice, mint caviar, and chocolate ganache in rice paper, an infused dish from Mass Cannabis Chefs. Marijuana has a reputation for reducing motivation, but in chefs it often seems to boost creativity. Like absinthe to Toulouse-Lautrec, it is a muse. Weed: the Other Green Fairy. 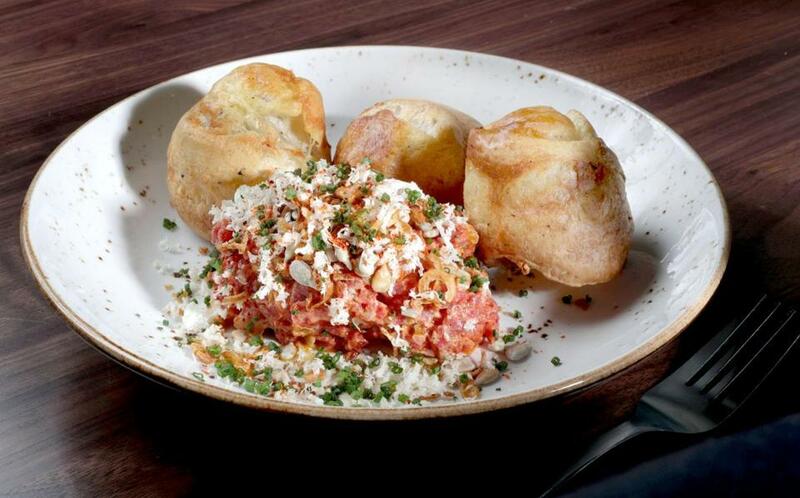 At Tapestry, one line cook often comes in with wild ideas after his day off, Ward says. Everybody loves fried pickles, but most people wouldn’t think to stuff pickles with a mixture of burger, onion, and hot cherry peppers, cut them into discs, fry them, and serve them with special sauce and iceberg lettuce: a deconstructed Big Mac. This stoner fever dream has since evolved; these days the pickle is stuffed with pig’s head terrine and served with a rarebit-esque cheese sauce. 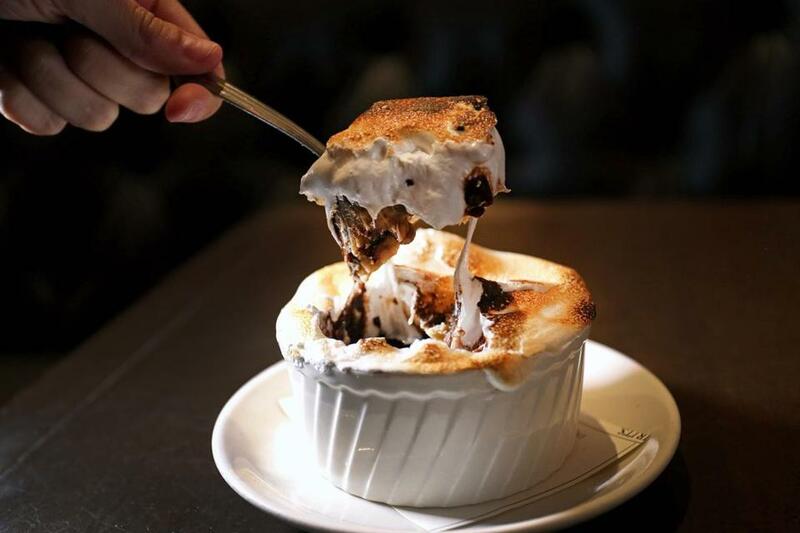 Little Donkey, one of the restaurants run by chefs Jamie Bissonnette and Ken Oringer, pays tribute to stoner food more successfully and creatively than just about anywhere in town, whether intentionally or no. Black pepper popovers and Wagyu steak tartare at Little Donkey in Cambridge. But, as a culture, our thinking on food has expanded. We care about where ingredients come from. The lines between high and low have blurred. It is inevitable that society’s increased awareness of and appreciation for good food should come to bear on what we think of as stoner fare, even when society has wicked cotton mouth and a yen for something just, like, super-super salty and super-super sweet at the same time. This past spring, Worcester restaurant Deadhorse Hill hosted a hemp dinner in collaboration with Luce Farm, a 206-acre organic farm in Stockbridge, Vt., that specializes in cannabidiol (CBD) products made from the hemp it grows. Unlike THC, CBD is not intoxicating, and it is reported to have health benefits from calming stress to reducing inflammation. It can also be purchased legally in all 50 states. 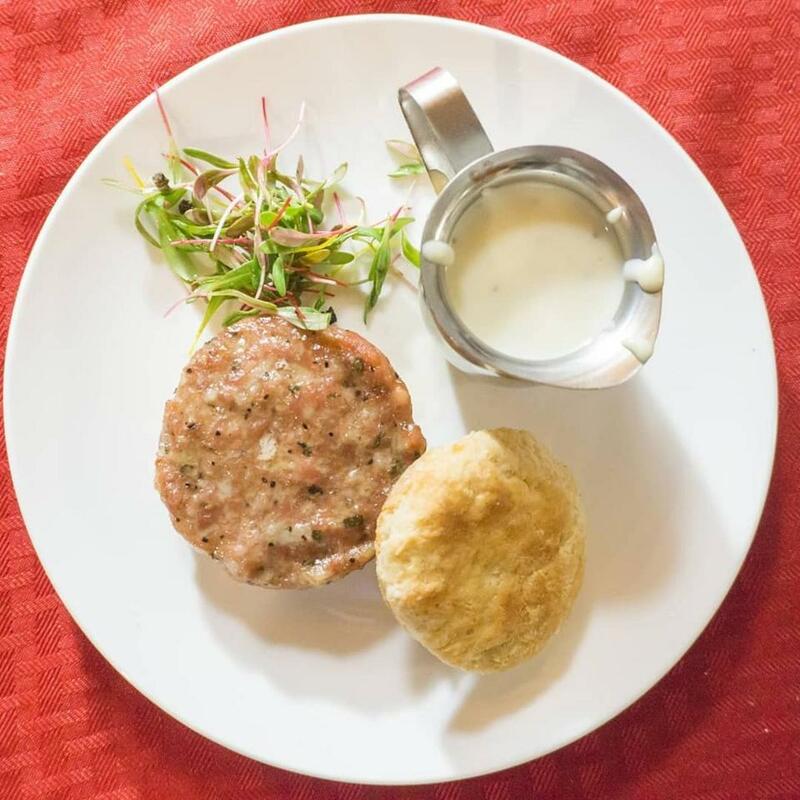 Breakfast sausage, buttermilk biscuit, and country gravy, part of an infused “Comfort Deconstructed” menu from Mass Cannabis Chefs. That’s still the exception. With most dinners like this, intoxication is one of the goals. Joseph Nelson and Patrick Mulcahy are the partners behind Mass Cannabis Chefs, which hosts cannabis-infused dinner parties featuring multicourse themed meals (Mexican, comfort food deconstructed, sushi night) along with glassblowers, live artists, and more. When it comes to eating our weed, we are basically still freshmen at a frat party. As the novelty of “our dinner made us sooooo high” wears off, maybe we’ll settle down and come to appreciate, say, marijuana’s nuanced flavors rather than its face-melting properties. But don’t worry, we’ll always have Stoner’s Delight. Gullo says it’s one dish she’ll never take off the menu.